Kanye West's favorite SUV is getting a mature facelift while still maintaining its classic look. The G-Wagon is looking good these days. The face-lift Mercedes-Benz gave the G55 AMG has finally been caught sans camouflage and the results were definitely worth the wait. No details have been given yet as to what sits under the refreshed model&apos;s hood, however we are expecting a more powerful version of their 5.5-liter V8 500hp engine. The boxy beast has some new styling around the front-end, as the new fascia gives the G55 a more mature look. The grille also features a new design, as the previous three bar design will be replaced by a new one bar style. The slight camo and unfinished front bumper still leave a bit to the imagination. 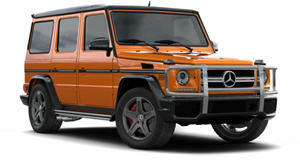 The G55 AMG also sits on a set of new wheels. No details on pricing or availability has been released as of this time. Photos courtesy of TeamSpeed.